I just learned of your excellent web site through Gary Powers, Jr. It's an excellent site that brings back a lot of fond memories. I'm curious if you know about the Nike Hercules radar being used by the CIA at Area 51 in Nevada. In case you don't, I'll tell you a bit about it. I was a 226.60 with a pay grade of E-5 at Fort Bliss from May 58 to Feb 60 when I entered the Hawk 227.10 school. When I graduated from the Nike Hercules school there were no assignment slots open, so I kicked around USARADSCH doing a bit of instructor and maintenance duty for the school until the Hawk missile school became available. When I graduated from Hawk school, the same assignment situation existed. I grabbed a chance to work for the CIA on Project Palladian evaluating the Hawk ECM and ECCM capabilities against the Soviet radar and air defense systems being installed in Cuba. Shortly thereafter, during the Iron Wall crisis, I deployed to Germany with the 6th Msl Battalion, 52d Arty, the first deployment of a combat Hawk missile battalion, thinking war would start at any time. 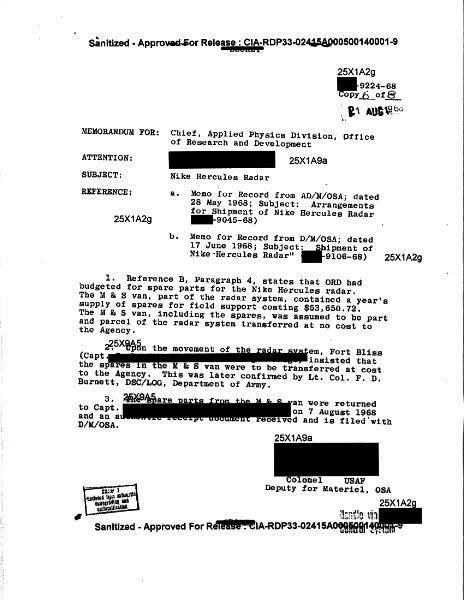 The situation in Vietnam was just coming to light about this time and because of my name being on the radar screen of the CIA, I was one of the first they came to for advisor duty. I agreed to go, but only as a commissioned officer. Thirty days later I was in Fort Sill attending OCS. To make a long story short, an injury in survival school left me totally disabled and terminated my military career. With all my radar training it was no problem getting a job on the NASA High Range tracking the X-15, XB-70, lifting bodies, and the CIA's A-12 Blackbird that later evolved into the Air Force SR-71. Our tracking station was at Beatty, Nevada, not far from the Nevada Test Site and the ultrasecret Area 51. In 1967 the good old agency appeared on my doorstep again. In Vietnam the MiG kill ratio was 9:1 superior to ours. During the Six Day War Israel had captured some Soviet MiGs and radar, which the CIA and the Air Force Foreign Technology department managed to bring to Area 51 for exploitation. At Area 51 the CIA A-12 Project Oxcart was just wrapping up and the stealth programs were on the horizon. The agency was recruiting a Special Projects team as cadre for Area 51 to evaluate the MiGs and for future black projects. They needed an X-band radar and someone to run it, so I ended up at the Ranch with my old Nike system plus a bunch of shot up Soviet radar systems to get operational. As the saying goes, "If I tell you any more I will have to kill you." ha Seriously, you'll note by the web sites linked below, much as you are, I am documenting the legacy of the Cold War participants in the recently declassified programs in which I had the honor of participating. You guys have a great web site that I will be linking to my sites if you don't object. One last humorous comment. About 50% of the Roadrunner Internationale association is composed of former Air Force personnel ranging from a 4-star down to several former NCOs. We have a lot of former CIA plus a few still punching the old time clock. The rest are the various corporate support personnel such as Lockheed, Kodak, Pratt & Whitney, etc. Two of us were contracted back then by the agency as a Special Projects team. None of the others were allowed to associate with us. We didn't exist. Also, only two of us in RI were Army. You'll note that I am president of Roadrunners Internationale. You can imagine the fun I have ribbing the Blue Suiters that my training them was the reason none of them ever got shot down during our spy missions. We have a reunion here in Las Vegas every two years.